The National Economic Consultative Forum (NECF) has congratulated President Emmerson Mnangagwa following his inauguration as Zimbabwe's Head of State and Government and Commander-in-Chief of the Zimbabwe Defence Forces (ZDF). President Mnangagwa becomes the country's second Executive President since independence in 1980 after taking over from President Mugabe, who resigned after being in charge for 37 years. In their congratulatory message, NECF co-chairpersons Dr Misheck Sibanda, who is also the Chief Secretary to the President and Cabinet, and Dr Robbie Mupawose said they were proud to have President Mnangagwa as their patron. "We write to congratulate you, Your Excellency, the President of the Republic of Zimbabwe, on your inauguration as the second Executive President of the Republic of Zimbabwe. "As NECF, we take pride in your visionary and inspirational leadership that you have exuded during the many high level NECF events that were privileged to host you as our guest of honour. "NECF events that quickly come to mind are the annual Zimbabwe International Trade Fair (ZITF) - NECF Business Conference, the Zimbabwe Agricultural Society (ZAS) -NECF Agribusiness Conference and the National Economic Symposium during which the annual Zimbabwe National Competitiveness Report is launched. "It is with great honour and pleasure that the NECF welcomes you as our patron and we stand ready to continue providing a platform for smart partnership dialogue amongst Government, business, labour, academia and civil society in building the economy," read their letter. NECF said it was happy with President Mnangagwa's inauguration speech. "Your inauguration speech remains a great inspiration and beacon to the NECF family and the nation at large." 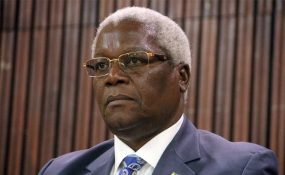 Separately, former Minister of Finance and Economic Development Dr Ignatius Chombo also sent his congratulatory message to President Mnangagwa. "I saw your inauguration as the second Executive President of the Republic of Zimbabwe with pride and contentment, especially after the goings on in both the party and Government during the last six weeks. "I wish I could attend but I couldn't because I am in hospital for some health problems that doctors are attending to. I missed all recently held meetings because I was away, learning some few hard lessons. "I wish to heartily congratulate you for your elevation to the position of President of the Republic of Zimbabwe, as well as the First Secretary of our beloved revolutionary party Zanu-PF," he said. Dr Chombo wished President Mnangagwa well in his new roles and responsibilities. "May God give you strength and guidance as you lead us into the future. You have my full support and loyalty in equal measure as I served the former President R.G. Mugabe during his tenure in office. "I am available to serve you in any capacity as you deem fit. Once again, I wish you all the greatest good and may God bless you ever more," he said.